PARIS – Monterey auction event is slightly different from previous gelara. 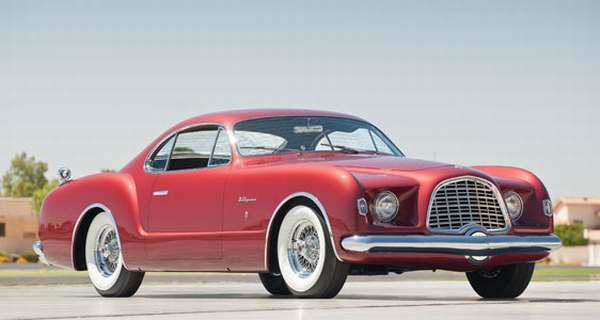 Auction sales this time includes a lot of special, one of which with the presence of 1952 Chrysler D’Elegance designed by Ghia. This vehicle is present in the Monterey auction event. D’Elegance has just finished in paint with metallic red color and interior design is dominated by black and beige. This car has a long history of this well-received when it debuted in Paris, October 1952. 1952 Chrysler D’Elegance was built using the chassis of the New Yorker 10 inches to 115 inches, and dashboardnya panel is the best design produced by Ghia. This classic car is expected to be sold between USD1.000.000 or USD 8.5225 billion to Rp11 billion, or approximately USD1.300.000. As reported by autoevolution on Wednesday (08/17/2011), the engine is increased to 354 cubic with a Hemi V-8 with 280 horsepower. Additional options are also included in the window lever, wheel and brake disc seat. Since its debut in Paris in 1952, Ghia only produce as many as 25 units of this car, and did not last long, the car was sold out. And at the upcoming Monterey auction event, this car is one of the cars produced only 25 units in Europe.